Facebook Advertising is an ideal platform for local business owners because of its low cost and local targeting capabilities. Furthermore, Facebook friends tend to live and work near you. 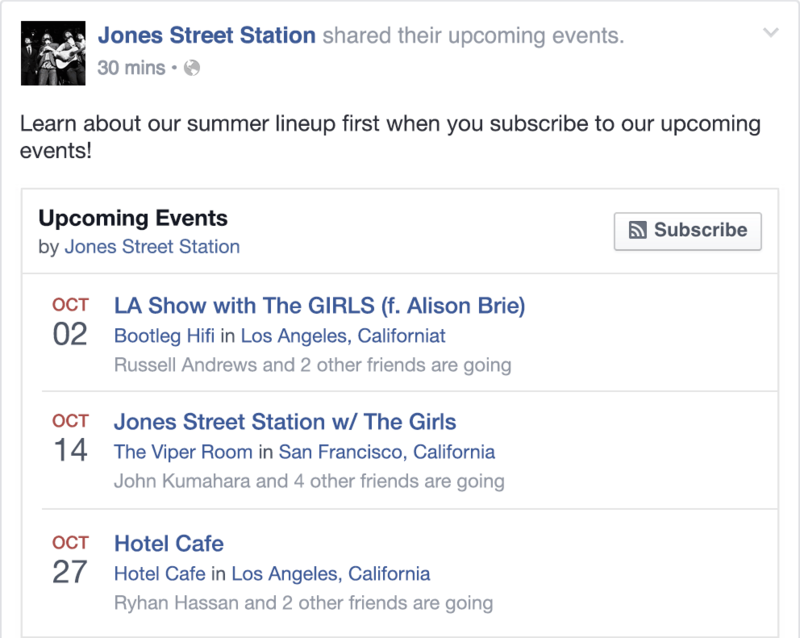 Therefore, for the most part, your Facebook newsfeed is a “main street” of sorts in your town’s digital world. Similar to putting up a billboard on a local highway, Facebook Advertising can allow a small business owner to quickly get his or her brand in front of a whole community. But wait – what about investing in pay per click ads in which you can go after people already looking for your service? While Facebook can definitely target users a great deal, it is a different platform than a search engine. People go on Facebook to connect and share with their friends. As a result, people are spending more time on Facebook: currently, the national average is 40 minutes per day. Therefore, it’s completely possible that your ad could appear multiple times on an individual’s Facebook page, each of those times building your brand awareness in a similar fashion to that billboard you see every day on your way to work. You may, in fact, be showing your ads to someone who already has a barber they go to, but then again… would that same person likely be looking for a barber in a search engine? With a compelling FB ad, you can get your brand in front of that potential customer who would not have found you otherwise. After working with dozens of local small businesses as well as a few national brands, I’ve noticed what works for a national client doesn’t always work for the local ones. In order to create that compelling Facebook ad, I’ve compiled 4 strategies to help a local business owner. Local Awareness Ads were really one of the first methods in which Facebook truly made it clear that they were an advertising platform for local small business owners. 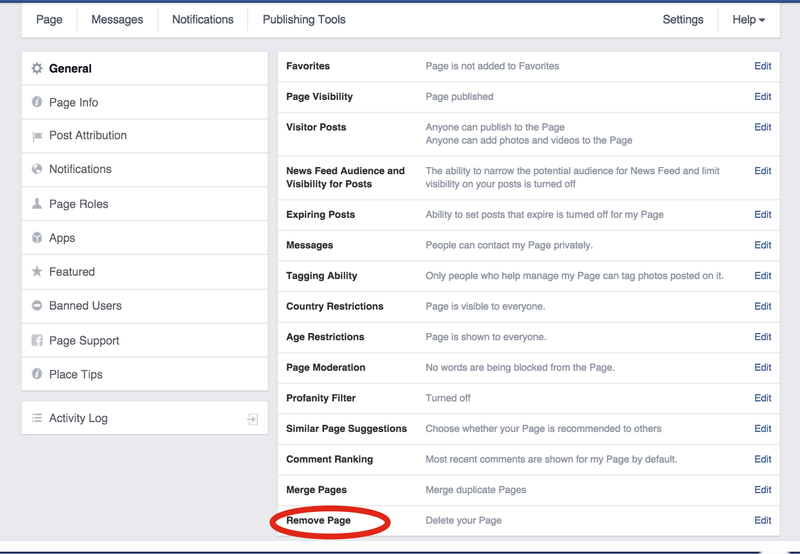 This ad objective – which is actually titled “reach people near your business” in Facebook Ads Manager – is definitely one worth taking advantage of if you are a local business. The greatest advantage comes from the fact you can make your targeting hyper-local, targeting Facebook users as close as within 1 mile of your business. In contrast, traditional Facebook advertising location targeting only lets you get as granular as targeting a particular city. This feature is great to capture individuals who may be dining near your business, working near you, or even traveling in the area. In the above ad, we call out the fact that the user is nearby. The user’s proximity to your business makes the ads automatically personalized to your user at that exact moment. G/O Digital surveyed users and found that 60% of users looked at a local business’ Facebook page before they visited that local business. This indicates there were quite a few users looking on Facebook prior to visiting a particular location. One critique of local awareness ads is the lack of more robust targeting segmentation, which is often praised as one of the strengths of the Facebook Advertising platform overall. The lack of more robust targeting segmentation is in reference to the fact that, at this point, you are not able to specify beyond gender, age, and location whom your ads will show to for Local Awareness Ads. While it is true this targeting is missing, it stands to reason your audience size for an ad like this would be incredibly small. Additionally, unlike the other Facebook ad objectives available, the ad objective for Local Awareness Ads is to go after people near your business. The local targeting is the main objective of the ad itself; therefore, it would be deviating from the point of the ad to include interest-based or behavior-based targeting. Local Awareness Ads also allow you additional call-to-actions, namely “Get Directions” and “Call Now.” The reason the calls-to-action are a little different with this ad objective is because you are reaching customers who are nearby, oftentimes on a mobile device. In the example below, I included a “Call Now” button and indicated that the potential customer could call and book their service appointment within the ad text. 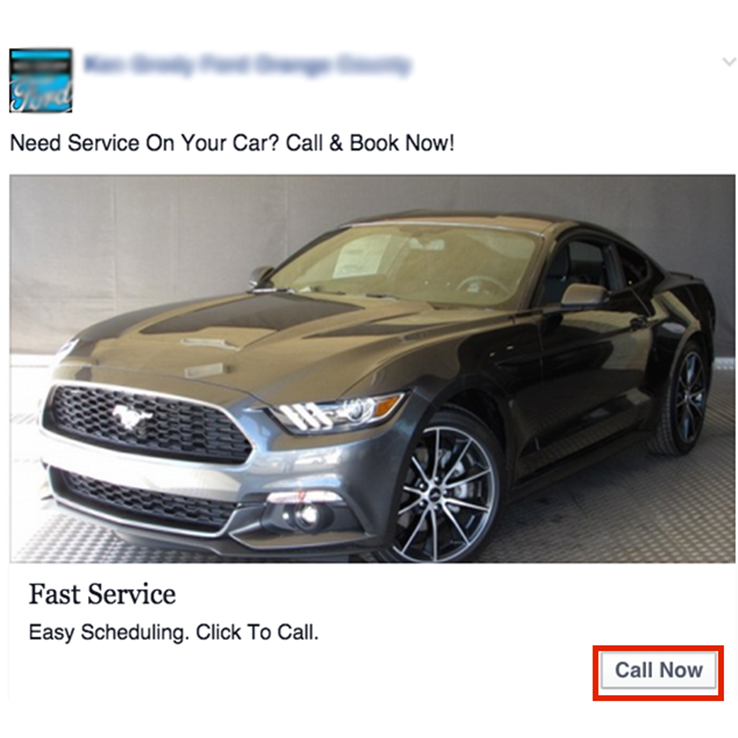 When it comes to Facebook Advertising, images really are a crucial part of your ad. A lot of my clients obsess over what image they should be using in their ads. A few spend a great deal of money on graphic designers to bring to life what they think is the perfect image often times including a great deal of text. However, most of my local clients simply don’t have the resources to spend on creating a custom image. One engaging image you can use without the help of a graphic designer – and one that most local businesses have – is a picture of your storefront. If you are targeting local customers, whether through a Local Awareness Ad or simply a city, chances are that the person has passed your business at some point. Seeing your storefront in the ad should immediately look familiar to them. Just as you scroll through Facebook and stop to look at a picture of your friend in front of a new car they just bought, you’ll immediately stop and look twice at an ad with a familiar place in the image. This is one of those advantages that not all national brands can leverage and one that a local business owner should consider adding into their Facebook ad. It’s also worth noting that Facebook actually has a 20% text rule for their ads. This means that if your image has over 20% text on it, it cannot be used in your ad. This rule exists because Facebook wants you to use engaging images not covered in text. They want this so much that they even provide stock photos within their ads platform. So don’t worry about all the text in your images – a high-quality photo is worth a 1,000 words. While you may be ditching text in your images, you can convey your message in your ad copy. In a Facebook ad, there are a few places to include ad copy, depending on which ad objective you choose. What makes a local business unique is your proximity to your market. Leveraging this information in your ad copy is a no-brainer, but you don’t have to just take my word for it. A recent study found that 4 out of 5 consumers want ads customized to their immediate surroundings. Consider including the name of the shopping center your business is situated in or even local landmarks near your business. Earlier this year Facebook’s COO, Sheryl Sandberg outlined the benefit in video ads specifically for small business owners. Sandberg spoke to the fact that video ads on Facebook present an opportunity for small business owners who might not have the resources to hire a film crew and buy a television ad. Sandberg has a point. Facebook, much like television, is a form of entertainment that has a large captive audience. Getting in front of that captive audience with a video that is engaging is a new ad format worth exploring. But can a video ad on Facebook viewed on your mobile phone really compete with a television commercial on a 50-inch television? An interesting study, released this past June, actually examined the neuroscience behind viewing ads on a smartphone versus a television. The study found that people were more attentive and tended to feel more positive towards information presented on a mobile phone. I suspect part of the positive impact on those viewing the ads may simply be because the ads shown to users on Facebook may be more targeted to that specific user. In order to begin introducing video ads to your local businesses’ Facebook advertising campaign, it’s good to go back to a point that Sandberg made reference to earlier: that you do not have to hire a film crew to put an ad on Facebook. Video ads can be completely unique to your business. A car dealership might highlight the inside of a vehicle in a video ad, whereas a bakery might show footage from the kitchen of a variety of pastries being made. Keep in mind that this ad is showing up in someone’s newsfeed; therefore, you want engaging content that is going to catch a user’s eye. While you can include sound with your video, it’s important to note that 65% of Facebook video views occur on mobile phones. So take a second to think about where your users might be if they are on their mobile phone, such as waiting in line at Starbucks or taking a break at their desk at work. The user may not be able to listen to audio. That being said, having a video that can convey your message without sound is incredibly important. Whether you employ all or just one of these local Facebook advertising strategies, you will help your local business build brand awareness in the populous digital highway that Facebook has become. The famous philosopher, Confucius, once said “The expectations of life depend upon diligence; the mechanic that would perfect his work must first sharpen his tools.” While Confucius lived centuries before computers or the Internet ever existed he had a point that is still completely valid, we all need to sharpen our tools every now and then. One of the most frustrating things a PPC manager can deal with is an improperly placed tag of any sort. I’ve been victim to far too many Webmasters who either didn’t place a tag or failed to properly implement my conversion codes and remarketing tags. The good news is Tag Assistant from Google will save you from all that by allowing you to quickly check your pages for your tags. It goes one step further and actually troubleshoots any issues with the tag so you can identify problems quickly. Are you really an SEO Manager if you don’t have the MozBar extension? Alright, maybe that’s too harsh, but seriously this extension is a big time saver when it comes to doing a lot of the research I find myself doing as a SEO manager. MozBar is capable of quite a bit for just an extension. For starters, you can quickly check out SEO metrics right on the search engine results page. Speaking of search, another valuable feature of MozBar is the ability to create custom searches with modifiers like city, state, and even search engine. Then you can take it one step further an actually get an analysis of your on-page elements such as title, meta description, headers and more. If you’ve ever done a FB ad… you will understand how valuable this tool is for your advertising campaigns. This is essentially Tag Assistant for Facebook Pixels (custom audience pixels or conversion tracking pixels). You can quickly see if the pixel is placed on the correct page and also see if there happen to be any issues with it that you may need to troubleshoot. 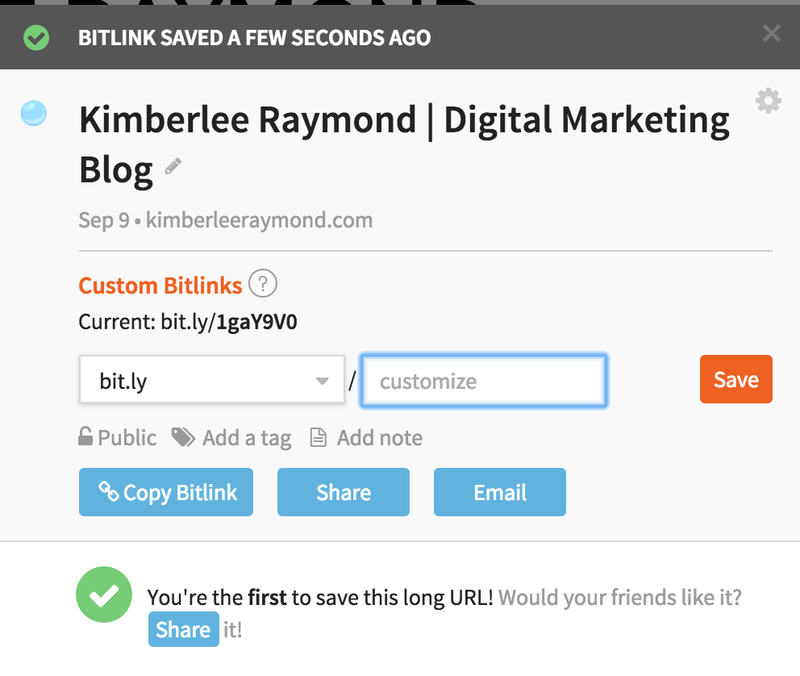 This nifty extensions allow you to quickly shorten links to share wherever you please. Since you are signed into your Bit.ly account it saves all of them so you can still go back and check out your latest stats on links you’ve recently shared. So if I come across an article I love and I want to share on social media I can select the extension and right there on the page copy my shortened url to share. Eye Dropper is pretty much the perfect extension for a graphic designer or an online marketer who occasionally needs to function as one. I’m relatively new to Eye Dropper, but I already like it a lot because it allows you to quickly pick a color from any website and save it for later. It’s very much like the eye dropper tool in Photoshop except now you can do it all while surfing the web without having Photoshop open at all. You can save it to use in photoshop or in presentations you might be working on. In particular, I find it useful when creating custom infographics or social content for clients and wanting to use their company’s colors in it. This one is more of a personal favorite, but I originally found it two years back when I was purely a social media manager so it is still completely applicable. To get things started you download the Pin It Button and sign in to your Pinterest account. From that point on when you’re browsing the web and you see a pair of boots you want to check out later you can hit your Pin It button and it will pull the image and link to web page into a pin and pin it to your board of choice all while not even leaving the webpage. I use it as a way to save gift ideas or just create a dream board of things I want on Pinterest. You can also use it to save articles to go back and read later. It’s a visual way to bookmark pages you want to check out later. What are some of your favorite Chrome extensions? I always love finding new ones, so comment below! Understanding the impact your social campaign is having on your overall website traffic can be difficult if yo u’re not sure where to look. Did you know that Google Analytics has a whole section devoted just to social? Below I’ll take you through it! First, how do you get there? The social section sits right under Acquisition (see screenshot). Once you’re there I recommend starting first on the overview section. Please keep in mind that this section is really only helpful if you have goals set up in analytics (goals=conversions). Otherwise you have no conversions to track. Not familiar with goals? Check out how to set up goals in analytics here. While in overview, you’ll see just that, an overview of conversions that your social channel is driving (the social channel can encompass multiple social networks). The circle graph shows your total conversions, contributed social conversions and your “last interaction” social conversions. Conversions: A conversion happens when someone takes an action that you’ve defined as valuable to your business, such as an online purchase or filling out a form on your site. Contributed social conversions: The number of conversions that any of the social networks in the social channel assisted in converting. This happens whenever the social channel appeared anywhere along along a customer’s conversion path except as the final channel. Last interaction social conversions: This is the number of conversions that the social channel completed. Another way to think of this is this was the last channel that a customer interacted with before converting. This is valuable because by looking at this chart along with the breakdown on the side of sessions and conversions you’ll start to see exactly how much your social channel is helping you not only drive customers to your site but also convert your customers. Tip: I would recommend also checking out “shared URLs” to see some of your most popular content on social. While we are on the topic of conversions let’s hop down to the conversions tab of this social section. Here, by clicking on Assisted vs. Last Interaction Analysis we can zoom in further on assisted or contributed conversions and last click or direct conversions. Keep in mind in this particular screenshot below we are looking just at Facebook. I see there were 2 assisted conversions and 1 last click conversions on this network in the selected time frame. In the final column I can see a ratio of Assisted/Last Click Conversions. If this number is over 1 that means that this social network, in this case Facebook, is more effective at providing assists than last click conversions. So why is this valuable? If you know Facebook is a more of a “first click” interaction as opposed to a “last click” interaction you can better target your social messaging to those new customers who have little to no knowledge of your brand. The network referrals section is interesting because it provides a side by side chart of your overall sessions (in orange) with your sessions from social referrals (in blue). This is a great way to quickly identify a post that did really well on social and resulted in a lot of sessions. Additionally, I like how down below all of this it breaks out the different social networks and the average time on site from each network. This might be a good way to identify which social network is driving your ideal customers to your site. The one thing I don’t like about the user flow functionality in Analytics is how much traffic there is condensed into one large chart. That being said, the social channel only user flow is neat because it is only a portion of your overall sessions (just those from the social channel) and breaks it down by social network. Even though I didn’t go through everything in this post I would highly encourage exploring the other parts of this social tab in analytics. If you’re active on any of Google’s Data Hub Partners, there’s a whole section for that called Data Hub Activity. The one Data Hub Partner that most of us are familiar with is Google+. This functionality allow you to dive into specific social “conversations” about your site. Beyond that, the landing pages tab is incredibly helpful as you can take a closer look at the most popular landing pages from your social channels. Those are just a few of the tools in Analytics to help you dive deeper into your social analytics. Hopefully, a few of them can be helpful. Make sure you are logged into your personal profile versus your business profile. Navigate to the page you would like to claim. 4. Once you select this you will be able to follow the on-page instructions to claim ownership (through a phone call, email verification or with documentation). 5. Facebook will prompt you after they have verified you are the owner. 6. After you have ownership (otherwise known as admin access) of the page navigate to the Settings section on the page. 7. From here navigate to the General section and find the Remove Page option at the bottom of the options. 8. You will be prompted asking if you want to delete the page. At this point either the page will enter a deletion mode and you will have 14 days to undo this. Occasionally, the page will automatically be deleted. 9. As another option, you can select merge pages (right above the Remove Page option) and submit to have your page merged with another page. You will want to select the page you want to keep as the top dropdown and the page you want to merge into the page you are keeping as the second one. Facebook will decide if you can merge these pages, one important factor is the names need to be similar. Please note only likes and check-ins will be carried over not reviews, photos, username or any other content. For more information please check out some of Facebook’s community forums. This particular post does a good job of addressing this question. Facebook has begun rolling out an exciting new feature that has a potential to offer tremendous benefits for small businesses. You can now get fans to subscribe to your events so they will automatically be notified anytime you are hosting an event near them. By clicking the subscribe button you have the unique opportunity to automatically notify all of your fans without investing additional money in Facebook Advertising to go after getting your event in front of fans. I noticed this new feature when one of my pages had a message this morning prompting us to “gather a community for your event” which is shown below. So I know what your thinking- “I’m a small business who doesn’t host events all the time- is this really worth it?” I think this feature can be utilized beyond its basic premise. One way is for contests. I know one challenge I’ve run into working with small businesses is that when we host a contest, we struggle to get the contest in front of all of our fans due to the limited organic reach on Facebook. By creating an event for your contest you create an easy way to quickly notify all of your subscribers about your contest and keep them posted on updates/and the final winner. Another neat aspect of this is with the increasing focus on mobile these days in the aftermath of the Google algorithm update last week is that it takes into account the user’s location and notifies them of the event when they are nearby. Grabbing the attention of a fan of your business when they are in the area creates a strong call to action for them to attend your event. I know I for one can’t wait to start gather my community of subscribers for events.